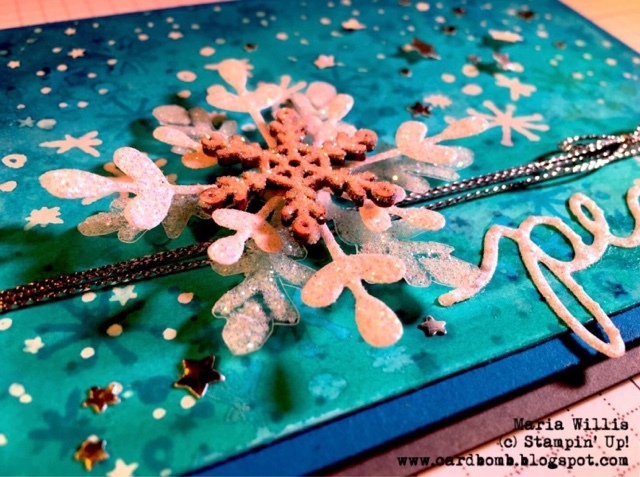 Cardbomb: On Stage Snowflake Card-Yippee! I am so, so, SO Excited!! that I'm totally yelling! Today is Saturday and that means today is On Stage day! I've never been to any Stampin' Up! event before so today is a big, exciting day for me! And now for a little secret that I've been keeping... a while back I applied to be on the Artisan Design Team. A few weeks ago I got an email from SU saying that they were still going over the applications and making their decisions but that I was invited to share one example of my very best work on one of their big display boards at On Stage! I'm so excited to have this opportunity and consider it a huge honor. Here is the card I made and will be displaying today at On Stage San Diego. Thank you so much Stampin' Up! I am thrilled! I wanted to make a card that wasn't easy to just whip up in five minutes. I wanted to combine some different, fun techniques and somehow mesh them together. I chose to do a ton of heat embossing with watercoloring and I am happy with how it turned out. I sure hope you like it too! I started out by heat embossing in clear on white Shimmer paper. 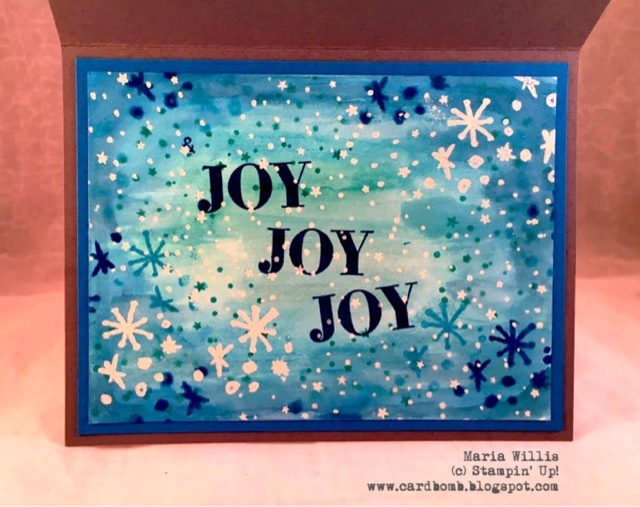 I used the fun snowflakes from Seasonal Snapshot 2015 and the smaller stars and dots stamp from Holly Jolly Greetings. After embossing I started adding color! Lots of color! I used my aqua painter, a spritzer and many colors of ink to add layers of color. I dried with my heat tool when it was necessary. Somewhere in the middle of all that watercoloring, I added more clear heat embossing to preserve some of the lighter colors under my snowflakes. Then I added more color to show the contrast. I also added a couple of stamped images with regular ink just to add more depth. Floating up the top right of my card is a sprinkling of stars cut out with the star confetti punch. The stars were cut from silver foil and some of my embossed dazzling diamond scraps. They were adhered with glue dots and the fine tip glue pen. When I was done creating the background piece I built a snowflake for the front of my card. 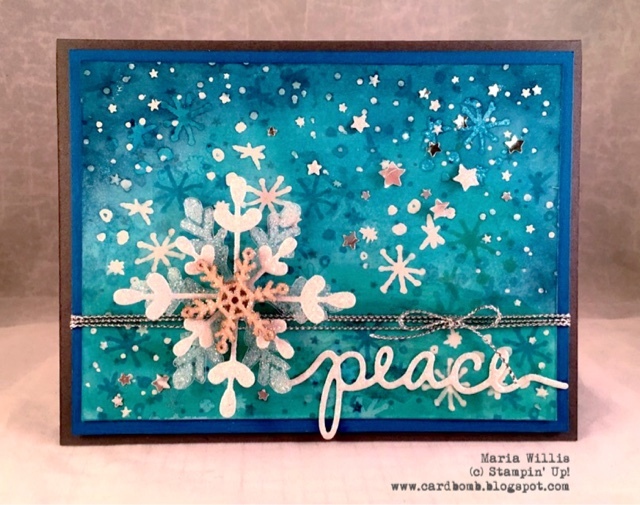 The bottom layer of the snowflake is from the Holly Jolly Greetings set. I heat embossed the large snowflake on a window sheet using Heat & Stick and Dazzling Diamonds. Then I cut the snow flake out by hand. The second layer of the snowflake is from the Snowflake Card Thinlits. It's still available on the clearance rack so I hoped it was cool to use it. I cut that snowflake out of Dazzling Diamonds glimmer paper. Finally, I topped my snowflake off with one of the snowflake wooden elements that I had embossed with Dazzling Diamonds. 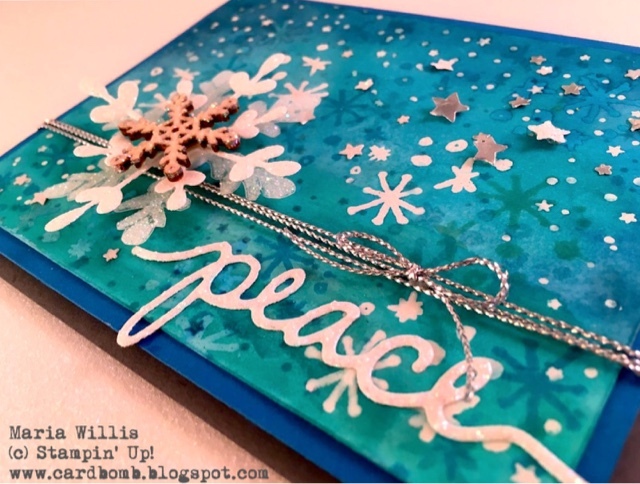 I finished the card off with silver cording and a "peace" cut from the Holiday Greetings Thinlits. The inside of my card is watercolored as well. You can tell that I didn't do as many layers of color as it doesn't have the same depth as the front of the card does. My sentiment is from the Holly Jolly Greetings set. My card is layered on base of Basic Gray and a mat of Pacific Point. I hope you liked my card! I'm sure excited to be able to share it with you. I will be back later with pictures of a most amazing day I am sure! Until then, you have an amazing day! I hope you may be lucky enough to be attending On Stage somewhere too. If not, I promise to share everything that I am allowed too! This is amazing Maria!!! I'm such a proud Stampin grandma right now!!! :) I hope you have the best time today!! !